Description: Throw away that old Easter basket and replace it with the fabulous Donald Duck Cart. This toy has a roomy and colorful cart to place Easter Eggs and candy into and the cart is pulled by a fun and friend Donald Duck. When the toy is pulled, Donald pumps his legs while his feet flip-flop around and he makes a "quack-quack" noise. FPT4295 - Wooden cut-out Donald Duck attached to a square wooden 4-sided cart. Donald has paper lithographs on both sides of Donald Duck wearing a red shirt with white trim, a blue tie, and a red hat with blue trim. Donald has orange acetate legs and large orange acetate feet that are attached to wooden wheels on the front of the toy. The cart has paper lithograps on the outside sides of blue "wicker" with yellow in the center. The yellow area has 4 red flowers, 4 small blue flowers, and green leaves in the center. 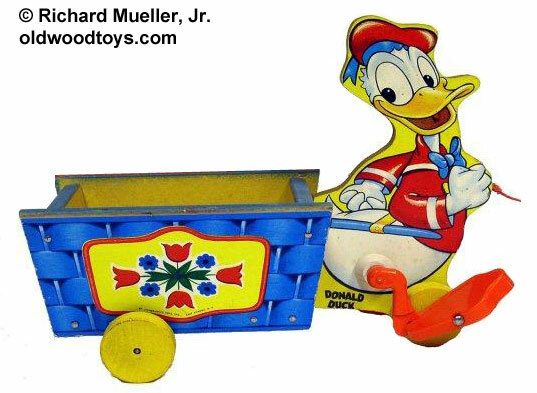 This toy rolls on 4 wooden wheels, 2 under Donald and 2 under the cart. When pulled, Donald's legs move, his feet flop, and he makes a "quack-quack-quack" noise. Measures 10" long. The 1956 Spring and Easter Dealer's catalogue has a Mickey Mouse Club logo beside this toy referring to Donald Duck's ABC Television popularity on this show.